One of the key benefits of using social platforms for customer service queries is that it adds a level of accountability. Use Twitter, for example, and your interaction is public - others can see what the brand says and how they respond, which can give you more leverage to hasten their response. "When customer service becomes public it becomes a spectator sport. If you are really good at public customer service, then your social care can become a new form of marketing." But there can obviously be downsides to that too - if you slip-up, fail to deliver, if you're not working to provide great customer support, then those responses can be amplified, and fast, damaging your brand reputation. 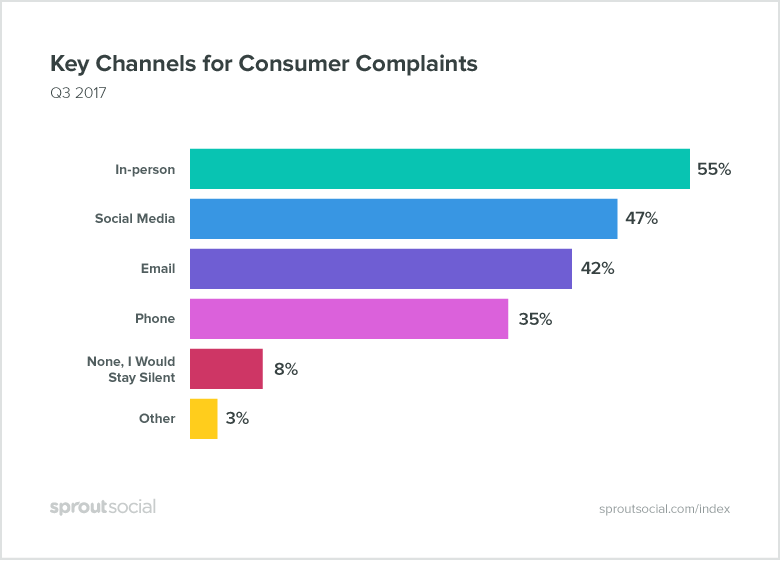 This evolution in process has also fostered a significant increase in consumer expectations - now, 84% of consumers expect companies to respond within 24 hours after posting on social media, while 72% of Twitter complainants expect a response within an hour. But how big an impact is this new way of approaching customer service impacting brand perception and expectation? Sprout Social sought to find out in their latest report, in which they surveyed 1,000 consumers to get a guage on the development of social care. 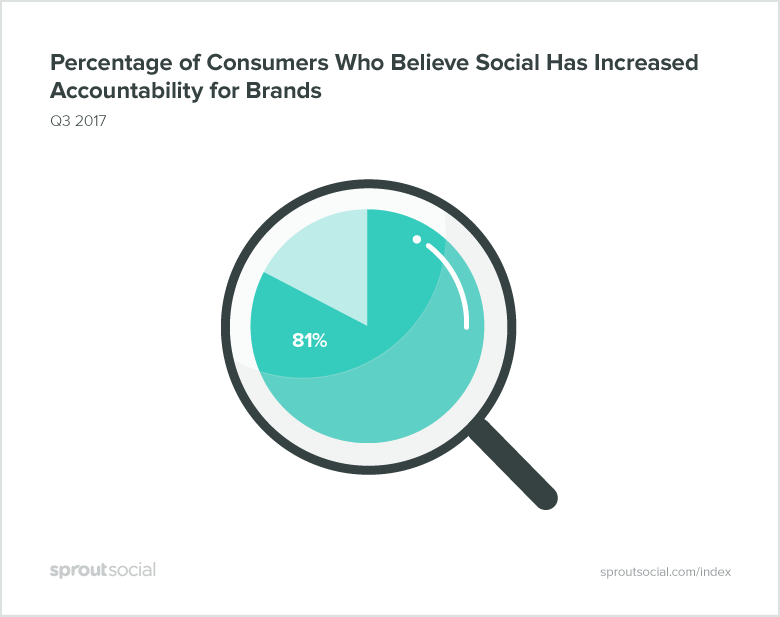 First off, Sprout asked whether social has increased accountability for brands, and the results were pretty definitive. It kind of goes without saying - as noted, people now expect faster responses to their queries, and they increasingly know they can turn to social to get them, as opposed to waiting on the phone. The public nature of social media definitely adds an additional layer of pressure, which is great for consumers who want faster, better responses, but it's also a key element for all brands to take into account. Such expectations don't come about for no reason, people expect this level of service because businesses are delivering it. Those who don't risk falling behind in the perception stakes. 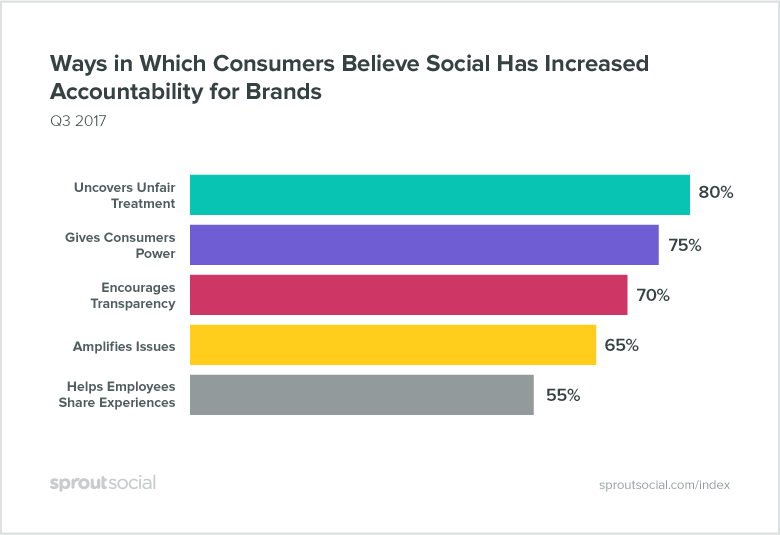 In terms of how, exactly, social is increasing brand accountability, Sprout's researchers found that unfair treatment of customers is now much more visible, as is the treatment of employees and overall transparency. These, again, are key measures to take into account - it used to be that brand discussion would only travel as far as your immediate circle of friends and those you talk to. But now, such opinions can be spread far and wide - in the past, you'd have had no access to your Uncle Dave's opinion on the latest iPhone, but now it shows up in your Facebook feed, whether you asked for it or not. The potential for amplification and influence is significant, making both transparency and awareness key. 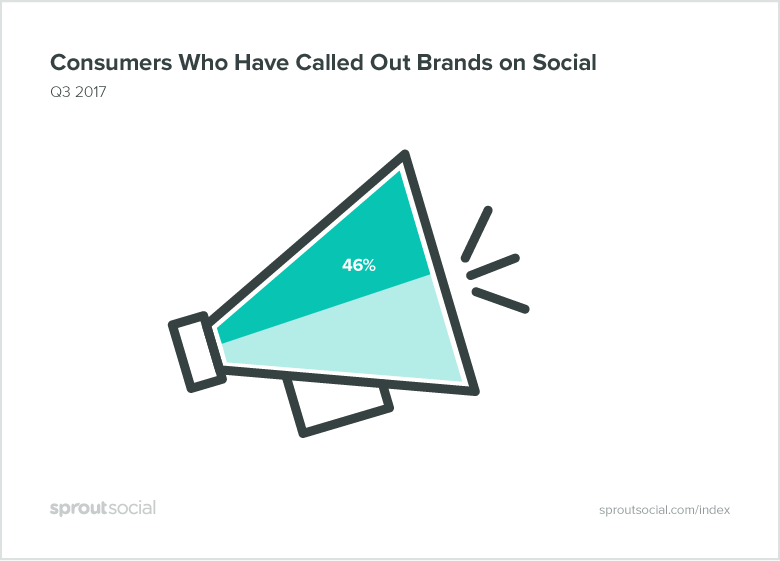 So how many people are willing to 'call out' a brand on social? According to Sprout's research, a lot. 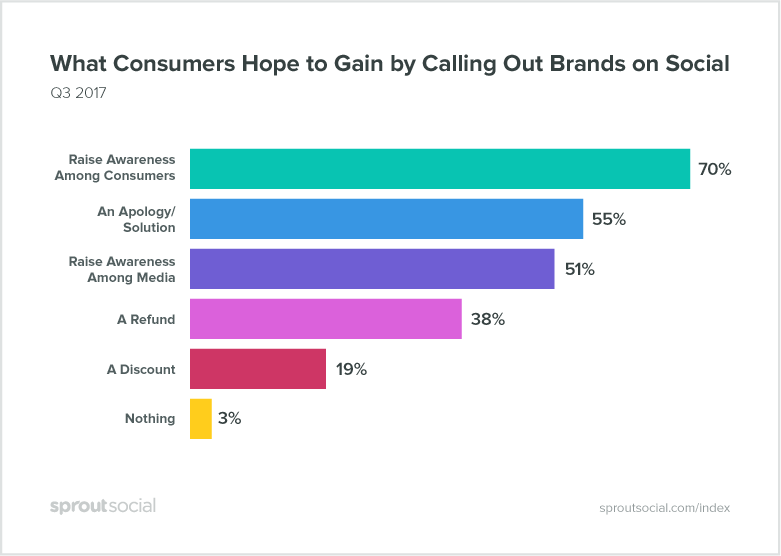 Nearly half of all respondents indicated that they'd used social to voice their opinion about a brand - which is both unsurprising and a bit of an eye-opener at the same time. As users become more aware of social customer service, and their capacity to use it to advantage, they're increasingly doing so. "That number jumps even higher when you slice the data by generation. 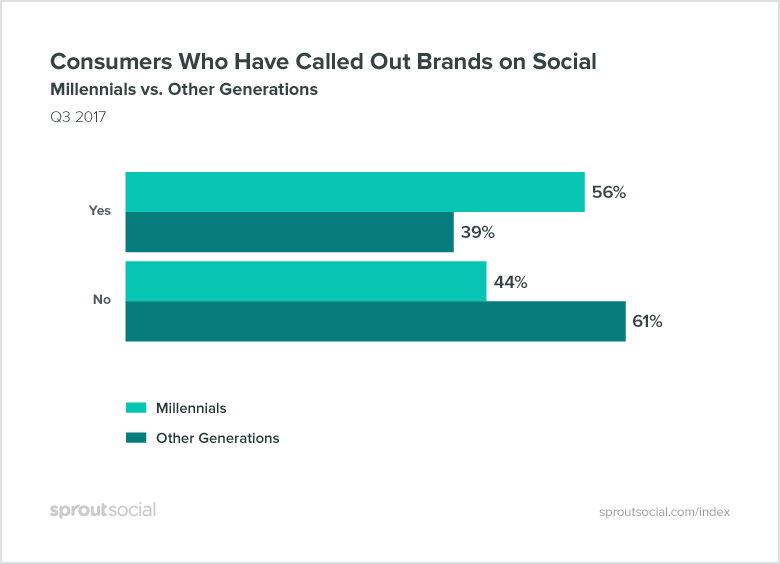 Unsurprisingly, Millennials are quick to take their frustration to the keyboard-56% of them have complained or called out brands on social. That means that Millennials are 43% more likely to call out a brand on social media than other generations." For the next generation, this is the way it's always been, their expectations are being established at that higher threshold. If you fail to meet it, they're likely to see you as failing them and move on. This is demonstrated once again in the key channels data - respondents indicated that social is second only to 'in-person' as the key means for raising service issues. "Even more telling about this era of engagement is the fact that only 8% of people would simply stay silent if they saw inappropriate behavior from a brand-showing that regardless of the medium they choose, consumers feel empowered to take a stand against brands." As noted, this is indicative of a wider shift in consumer expectation, it's not isolated to specific sectors or bigger business. The more companies that are meeting these expectations, the more people are coming to expect the same from others, raising the bar for all. Sprout also sought to find out what's most likely to inspire a social 'call out'. The number one issue which ticks customers off? 'Dishonesty'. Interesting to note here that 'Bad Product/Experience' came in at fourth on the list, meaning that service and brand response is a significantly bigger issue than the product itself, at least in this context. General rudeness and misrepresentation are what sting customers the most, something that all brands need to take into account, and reiterate to their staff on all levels, but especially those in client-facing roles. These days, it's not just that one client you're speaking to at any time, it's potentially everyone who'll ever look you up online, and if the issue is particularly bad, it could spread far wider than that. Also note 'Too political' down the bottom of the chart. It depends on your business, but in general, your political opinions should be confined to your personal conversations. And what do consumers want in response to their 'call out'? Notable here is that getting a response from the brand is the second highest desire - people are often simply seeking acknowledgment of their issue, an apology, for the brand to take responsibility. That can sometimes be all it takes to turn a negative interaction around, and as such, businesses need a social listening plan in effect, and a response team ready to engage. 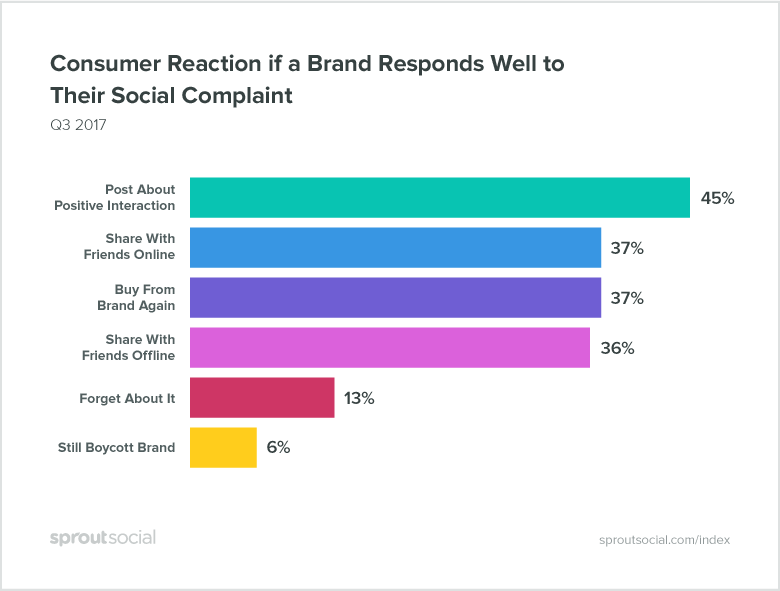 This is further underlined in another segment of the data, looking at how consumers respond when a brand acknowledges their issue in a positive manner. 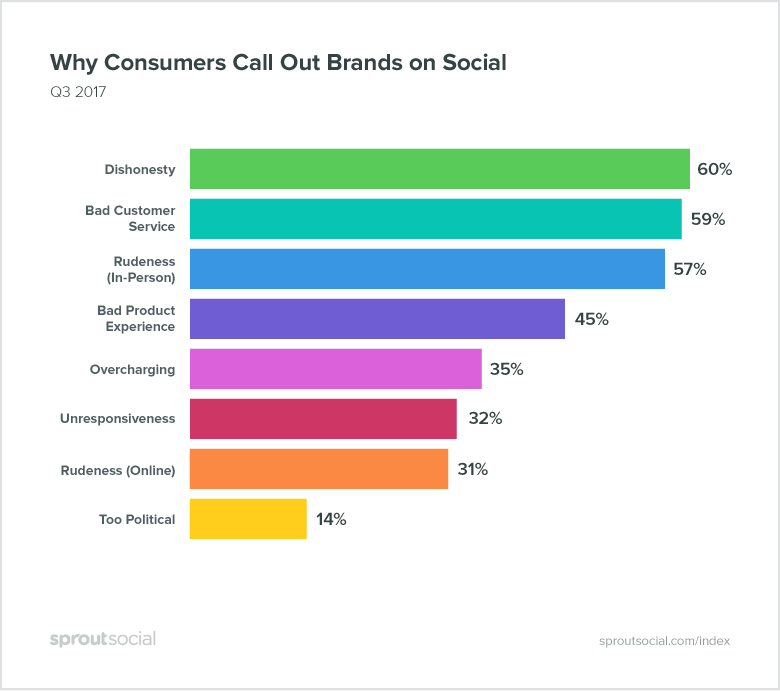 There's a heap more insights in the full Sprout Social report, including industry-by-industry breakdowns, further data on consumer responses and expectations, and more details on the specifics of the study. This is great insight, a valuable reminder of the importance of social customer care. In essence, consumer expectations are increasing, and they're looking for brands to not only have a social media presence, but to be responsive and to listen to them online. Those that fail to deliver are going to fall further behind as such processes evolve.